Usually I don't blog about work, but I'll make an exception here. This weekend, Jerry, Justin, and I drove up to the Megasquirt convention. Some of the well known people in the Megasquirt world couldn't make it, but many of the distributors, coders, and people who just have provided a lot of support were there. Bruce Bowling and Al Grippo attended, of course, and so did Scott Clark, Scott Hall, Peter Florance, Rodney Sparks, James Murray (all the way from England), Ken Culver, and many other of the well known members of the community. It was great to be able to meet people I'd only seen on the Internet and message boards, and hang out over a few beers. Many of them didn't look the way I imagined at all. I didn't bring my camera, but the guys from 1320Video.com captured a lot of it in this gallery on their site. You'll see some interesting cars and trucks there, including an Isuzu Amigo with an Eaton blower. If Satan ever took up dentistry, his drill would sound like that SUV's motor. We had some interesting informal demos and talks on Friday night, including Bruce bringing in the scarriest wheel decoder tester I've seen. He made it out of a circular saw. Saturday morning, we went over to AED's Mustang chassis dyno. Wes's four banger Mustang won that shootout thanks to a Garret GT32 turbo and a tank full of alchohol. He posted 390 hp. And yes, it's a street car. We picked that time to unveil our Megasquirt PNP plug-in ECU for the Miata. We had driven the Miata all the way from Atlanta on it, making a few last minute changes to the fuel map on the freeway. It wasn't exactly the most comfortable car for the trip. We then had a few talks on Megasquirt additions that have just come out. James and Ken presented the MS2/Extra code, and Scott was there to present the Spectre eMS-Pro. Other things they covered included MegaTunix, the CANBus (which right now has been unexplored as there are no peripherals that use that; Bruce was hoping to change this), and the next development of Megasquirt, which has been known as the router board or Megasquirt-III. This one is a bit more than just a sequential add-on to Megasquirt; it's pretty much a redesign from scratch. I'm definitely glad I went. I've picked up a few more parts for the Dart. I went and bought an 8 3/4" rear axle, with tapered roller bearings, E-body drums, Moser aftermarket axle shafts, and a Sure-Grip with 3.23:1 gears. Is this overkill? Probably. But choices for a hopped up A-body with the large (5 x 4 1/2") bolt pattern seem to fall into two categories: Maybe not enough, and too much. There's two factory axles that had this bolt pattern in A-bodies. I've heard of the 7 1/4" breaking behind naturally aspirated slant sixes. The 8 1/4" axle is a bit more durable, and might have worked on the Dart. Or it might not have. Still, it came behind the 360, and it was adequate for that. 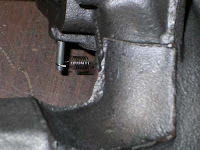 The other axles either weren't installed in the large bolt pattern, or weren't installed in A-bodies, period. You can get an A-body 8 3/4" rear axle, and these can live behind a 400 to 500 hp engine with no problem. But the factory axles had a 5 x 4" bolt pattern that you can't find wheels for, and it's risky to drill them for bigger bolt patterns. 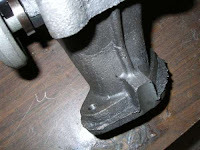 So you need to get new axle shafts or have C-body ones cut down. And there are companies that offer the ultimate axle Mopars used, the Dana 60, cut down to fit an A-body, at a pretty hefty price. More than the $1,250 this axle set me back. And I also picked up a MSD-6A ignition box for the Dart while I was in Richmond. You may have heard me mention I had been thinking EDIS and even picked up some of the hardware for it. Well, I've sort of changed my mind. Now my plan is to make it run with the MSD-6 and the HEI module, then eventually convert it to a crank trigger and have a Megasquirt (not necessarily the one in there now) drive it directly. 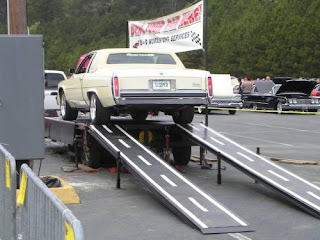 But once I have it running, I plan to do a somewhat over the top ignition shootout: I'll gather up a bunch of different ignition systems and test out all of them on a dyno. I've never heard of anyone comparing EDIS to an MSD box and flogging the two on a dyno back to back, so it will be interesting to see what happens. Stone Mountain Cool Car Festival: Oooh, shiny! This was probably my favorite paint job at the whole show. Luckily I was able to snap some shots of it before he opened the hood. I really prefer to photograph most show cars with the hood closed, as that's a much better way to show how the entire exterior package really works. But it seems like it was practically a requirement here that you must pop the hood when you show your car, even if it's just another small block Chevy with a few bits of chrome. OK, so putting it on Cragars may hint it belongs to an enthusiast, and writing "SLEEPER" on the license plate seems a bit counterproductive. Still, who'd expect an old yellow Cadillac barge to be packing an injected smallblock, or to put 280 hp to the rear wheels? That's probably eighty more than it originally made at the crank. I learned about this short film in a discussion on the Grassroots Motorsports board about great car chases. This is a short film called Climb Dance. There isn't any plot to it; it's simply a Peugeot rally car on Pikes Peak. And you can watch it on Google Video. Enjoy! Has Toyota jumped the shark? Do you think Toyota's execs, engineers and workers are somehow smarter than those of GM? They aren't. Given time, the dialectics of decline will take hold at Toyota just as they have in Detroit. The unraveling has to start somewhere. One of my favorite car magazines, Grassroots Motorsports, also happened to review the Yaris, and their quoes were less provocative but more amusing. Some gems included "Unprecedented body roll ruins otherwise decent handling," and "Ugh, I wish this had more horsepower, a better suspension, and looked less like a toaster." It does sometimes make me wonder if Toyota's heading down an all-too-recognizable path. They've made questionable calls with their enthusiast cars (leaving the 180 hp motor out of the newest MR2 even though it dropped in, or what about their Scion concept that attempted to make the xB look like an off roader with the stock suspension? ), concentrated heavily on volume, and given their bread and butter cars a reputation for a soft ride at the expense of handling. Now they've started to spread out with a new division using cars that share the same underpinnings as their others but trying to attract buyers with different styling and bodywork. Is Toyota trying to immitate General Motors? 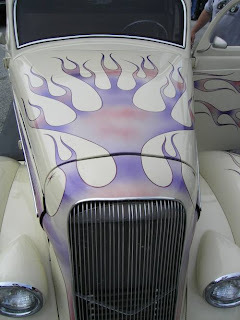 I went to the Stone Mountain Cool Car Festival last week, and took a lot of pictures. I'll be posting these throughout the next week; there's just too many images for one post. I'll start this with a collection of Chevy Novas, because my wife Kelly is fond of them. These four here are a collection of her favorite body style of Nova. Although it's not Kelly's favorite year, this one that Year One brought along really stood out. When I looked under the hood, my first thought was that they'd put an LS1 in it. After all, it wasn an injected motor with that distinctive coil-per-plug ignition. 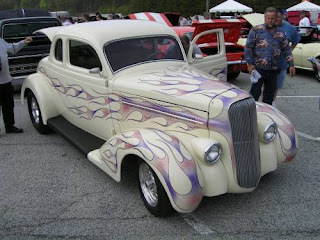 That would have stood out on its own, as most of the injected cars there were either modern Mustangs or PT Cruisers. But something didn't look right. 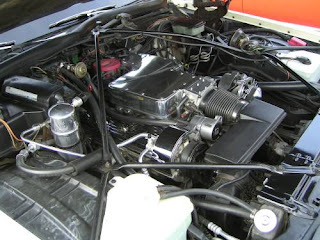 The engine was too large for an LS1, and the intake had paired ports. 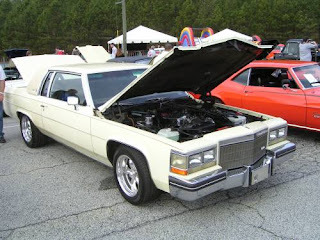 I took a closer look, and realized it was an injected big block Chevy fitted with an LS1 ignition! As some of the pictures before show, I needed a new manifold for the Dart. I figured I could find one in a local junkyard, but it's a bit of work to pull one and it's hard to check one for cracks until it's off the head. So I thought my best option would be to order a brand new reproduction exhaust manifold from 1A Auto. Now that the manifold's here, I'm almost starting to wonder if I should have used a junkyard piece. It's OK, but not quite what I'd hoped for. 1A held up the shipping for a day because I'd entered a year their computers did not say the manifold will fit. Well, this manifold fits all slant sixes, even though it's most closely based on the 1980s version. I'm saying that because it has the later style heat flap and an oxygen sensor fitting (although with my turbo, it would be a better spot for an EGT probe). So I had that straightened out before it would ship. I appreciate a company checking to be sure my parts are the right ones, but I'd rather they get the checking done correctly. 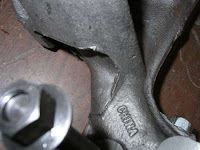 While they did seem to make an effort to reinforce the manifold, the casting quality is not the best. There's casting flash everywhere, some of the sections are misaligned, and it looks like there's a bit of casting sprue on the headpipe flange. Here are some pictures of it from before I took an angle grinder to it to remove the flash and the choke tower (which just gets in the way on an injected motor).